You can have fun and airy bedroom setting with help from this youthful poster bed. The piece carries a beautifully arched headboard and footboard, each with a floral-painted center circled with an oval wood carving. 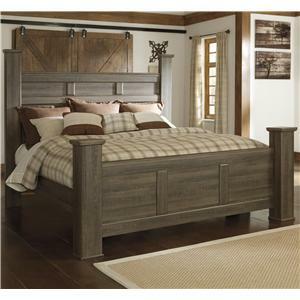 Plus, the exquisitely turned posts add a regal quality to the overall look. There will be so much to like with this poster bed in your child's bedroom. This bed is available in twin and full sizes. The 01660 Twin Poster Bed w/ Floral Painting by Acme Furniture at Furniture Superstore - NM in the Albuquerque, Los Ranchos De Albuquerque, Rio Rancho, Santa Fe, Corrales, NM area. Product availability may vary. Contact us for the most current availability on this product. The 01660 collection is a great option if you are looking for Casual furniture in the Albuquerque, Los Ranchos De Albuquerque, Rio Rancho, Santa Fe, Corrales, NM area. Browse other items in the 01660 collection from Furniture Superstore - NM in the Albuquerque, Los Ranchos De Albuquerque, Rio Rancho, Santa Fe, Corrales, NM area.